A stock (or share) market deals mainly in corporate securities. The securities are chiefly in the form of equity shares and debentures. The function of the stock market is two-fold: to arrange for the raising of new capital [primary market function] and to provide liquidity to existing securities [secondary market function]. There are 24 recognised stock exchanges in India, including the Over the Counter Exchange of India (OTCEI) for small and new companies, the old established Bombay Stock Exchange (BSE) and the National Stock Exchange (NSE) that was set up as a model exchange to provide nation-wide services to investors. As at end-March 2010, 4977 companies were listed on the BSE, which is the largest exchange in the country. The number of securities available for trading under the equities segment at NSE as on April 30, 2010 was 1872. Associated with the NSE are the National Securities Depository Ltd. (NSDL) and the National Securities Clearing Corporation Ltd. (NSCCL). The NSDL acts as a registrar for dematerialised securities and NSCCL as a clearing house. 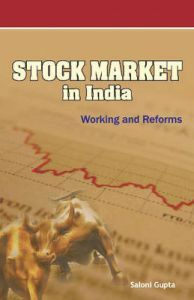 This book provides a comprehensive account of the working of stock market in India, focusing on reforms introduced during the post-liberalisation (1991 onwards) period. Besides, it traces recent trends in the secondary market and offers empirical evidence of level of efficiency and degree of volatility in the Indian stock market.